If the Franklin car had been named by the same rules as Rolls-Royce it would have been the Franklin-Wilkinson. Franklin was the promoter, Wilkinson the genius who built an experimental car for Franklin to market. But slightly before Rolls met Royce—1902. Like Rolls-Royces, Franklins were built with an eye to quality and no thought of penny-pinching. There is another R-R connection: the 20 hp that C.S. Rolls brought to the US in 1906 to compete in the Empire City races was later sold and campaigned in Florida, where it “handily won a 12-mile race against a 30 hp Franklin.” Being air-cooled and thus devoid of overheating problems, Franklins did well in races. Much like—again a Rolls-Royce connection, simply to emphasize that the Franklin really play at that level—Claude Johnson, Franklin saw the publicity value of endurance trials and in 1904 a runabout piloted by transcontinental driver L.L. Whitman and Franklin rep C.S. Corris drove from NY to San Francisco in 33 days, breaking the previous record held by Packard and Winton by almost a month. When I heard about this book, I hastened to get a copy and read it. 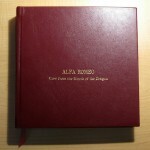 It is scholarly and a bit pedantic in style, with many footnotes detailing sources of information. Although it goes into some detail about the mechanical development of the Franklin and its styling (cross-engine to barrel hood to Renault copy to “horse-collar”), the emphasis is more on how Franklin fit into the overall automotive landscape of its time. For instance, in 1905–1906 it was a relatively large producer, comparable to Ford and Buick. It started out as a small lightweight car and soon became a medium size, but still lightweight, car. As its size grew, so did its price. Originally competing with Buick, Studebaker, Nash and Hupmobile, it moved into the price class of the Marmon, Peerless, and the low-end Pierce-Arrows and Packards. Herbert Franklin, whose name the car bore, is characterized more as an entrepreneur and businessman than as an engineer. He had gone from editor of a small newspaper to a successful die-casting business when he decided to build the car designed by recent Cornell graduate John Wilkinson. Wilkinson was in charge of engineering and manufacturing from the beginning in 1902 until 1924. Franklin’s editorial background appears in ads over the years as common-sense appeals to prospective buyers unpolluted by hype. Powell portrays him as a sensible, if somewhat autocratic businessman, with less drive than the automotive giants of the time, such as Ford, Chapin (of Hudson) and Durant. Powell offers opinions about what caused Franklin’s successes and failures. Contributing to its success were a superior ride (due to the aforementioned minimization of unsprung weight), above-average fuel economy and over-all high quality. Franklin was also well ahead of most manufacturers in setting up laboratories for physical and chemical testing. Failures seemed to be due to lack of purpose or poor executive judgment. One instance was the abandonment of the design of a less expensive four-cylinder model in 1922. Announced with fanfare early in 1922 and with a staff of 300 to bring it into production, the project was abruptly terminated in the fall. Another was the marketing of a 12-cylinder car in 1932, when the effects of the 1929 market crash were deepening. Not only was it an expensive car, but its general design had been dictated by a bank-appointed executive who had no regard for Franklin engineering traditions. The penultimate chapter of the book consists of interviews with former employees who confirm that Franklin’s reknown for advanced employee relations was indeed deserved. 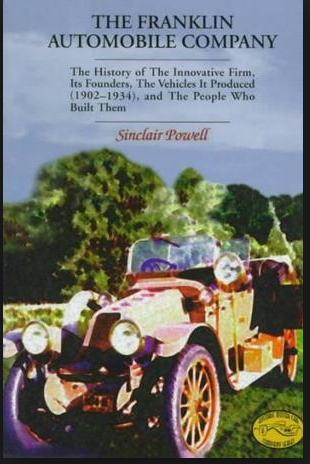 Powell is a retired lawyer and high-level activist in the field of automotive history. A stint as president of the Society of Automotive Historians and being a member of the screening committee of the Automotive Hall of Fame give him a singular vantage point from which to separate the wheat from the chaff. 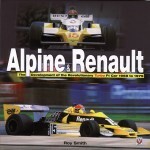 The book is published under the auspices of the SAE Historical Committee, a body that has contributed immensely to the advancement of the body of automotive knowledge. 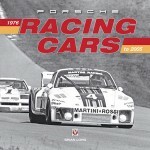 Copyright 2000/2013, John Utz (speedreaders.info). Unfortunately this book is out of print. I have a copy and it’s not going anywhere, thank you. As an old car enthusiast for 50+ years I came late to my appreciation of the Franklin automobile – by far America’s most popular air-cooled car until Volkswagen and Porsche came to these shores (some 20 years after Franklin succumbed to the Depression). Franklin built the first four and six cylinder production cars in America. Guesstimates (informed) place life time production of about 150,000 cars. Several thousand survive and are doted on by an active club (franklincar.org) with members around the world. 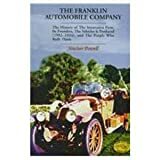 Sinclair Powell’s book is at the most complete coverage of the Franklin story yet published and should be of interest to car enthusiasts everywhere.